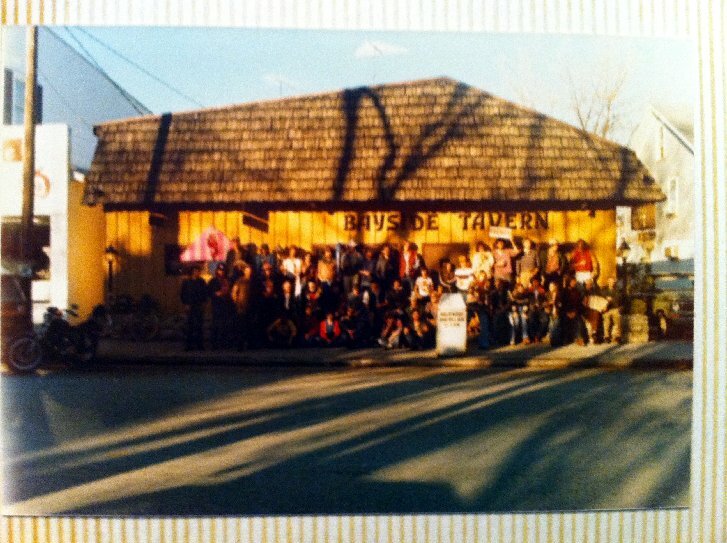 In August of 1 975, Bob and Elaine MacDonald, aka “Smilin’ Bob and EMac” moved their six kids and a son in-in-law from the small home they built in Green Bay to their new home in Fish Creek when they bought the Bayside Tavern from Ray Wolter. With all six kids working behind the bar, the Fish Creek “locals” like the Hollisters, Krauses, Demarinis, Redmanns, and Kinseys, along with regulars like Danny, Edie, Maizy, Stanley and Calhoun, looked like a bunch of aliens had just crashed their party just as Smilin’ began to realize his kids were already eating up all the profits. It was the start of a long and incredible adventure that changed the face of Fish Creek and its population sign. It took vision and courage to make such a bold move and for creating and maintaining Bayside as a place where friends and family come together to celebrate good times together. The 1970s-era shag carpet and harvest gold paneling are long gone, but if you stop in today, Smilin’, EMac and their extended family are still there reminding us that while the County has changed a lot since 1975, some of the classics remain.